Gotu kola, a longtime staple of Traditional Chinese Medicine, is classically used to rejuvenate the skin. Discover its history and varied uses here. Gotu kola, an herb originating in South East Asia, has a history of popularity in both the medicinal and culinary worlds dating back to ancient times. It has been continually used as an effective remedy in many herbal traditions, allowing for its popularity to spread around the world. Enhancing memory. The neuroprotective properties of gotu kola has shown to improve cognitive function in people with Alzheimer's disease. Speeding up wound healing. Gotu kola increases blood flow, bringing more nutrients to the skin's tiny blood vessels and subsequently quickening scarring after burns or injuries. Preventing stretch marks. The active compounds in Gotu kola help strengthen the skin, thus reducing the chance of stretch marks. Treating venous insufficiency. Gotu kola can reduce swelling and leakage from blood vessels. Decreasing joint pain. A preliminary study has found that gotu kola can diminish pain and skin hardening associated with scleroderma. Gotu kola possesses triterpenoid compounds (mainly asiaticoside), which are responsible for the wound healing effects of the herb by regulating collagen production. Recent studies have discovered that gotu kola may also be effective in treating cellulitis. Goty kola content also includes high levels of carotenoids, as well as other phytonutrients, such as flavonoids, volatile oils, tannins, and polyphenol. Another reason for gotu kola's varied medicinal properties is its high nutritional value. The herb contains a large number of vital nutrients, including B-group vitamins and vitamin C (ascorbic acid), calcium, iron, serine, lysine, magnesium, tannins, and glutamate. Triterpenoids are thought to strengthen the skin, which can make gotu kola effective in treating burns, scars, and stretch marks. Aloe and jojoba also speed up wound healing, whereas ginkgo and rosemary increase blood circulation. Side effects are rare, but when the herb is applied externally in high doses, may include skin allergies and burning sensations. Headaches, stomach upset, nausea, dizziness, and extreme drowsiness can be the consequence of oral use. Children, as well as those with a history of skin cancer, or suffering liver disease, should not take gotu kola. It can also interact with liver medications, statins, diabetes medications, diuretics, and sedatives. The herb should not be used longer than six weeks at a time, except under medical supervision. It is not common for people to eat raw gotu kola; however, its nutritional value remains particularly potent in this form. Gotu kola is also used as a leafy green in Sri Lankan cuisine and normally accompanies curries or seasons rice. It is a popular addition to many vegetarian meals. In Indonesia, the gotu kola leaves are commonly used in salads. While gotu kola has culinary applications, it is mostly used as a medicine. Herbal preparations are made from the leaves and stems, which are sometimes powdered. Infusion. The dried leaves can be brewed into a warm tisane. Gotu kola tea improves circulation and eases digestion. Poultice. The crushed gotu kola leaves or gotu kola powder can be hydrated in warm water and used topically for treating skin ailments. Ointment. This preparation can be applied over the skin to reduce irritation, and it is also used for cosmetic purposes. Tincture. 30 - 60 drops of this concentrated preparation should be diluted in a glass of water and taken two to three times daily. Capsules. This popular supplemental form provides a consistent dosage of gotu kola's active ingredients. Raw gotu kola is difficult to locate outside of countries that frequently use it as a culinary ingredient, but dried gotu kola is easier to find in specialized health stores, ethnic markets, and through online retailers. The most common presentation of gotu kola includes its dried leaves, either whole or powdered. It is also available in premade teabags. Gotu kola remedial and supplemental forms, such as ointment, tincture, and capsules are much popular and easier to find than the natural forms of the herb. They are readily available for purchase in specialized health stores and through online retailers. It should be noted that each brand of may come with different concentrations, and reading the labels is important to ensure the quality of the product. Gotu kola is found growing in swampy areas of most tropical and subtropical countries, including parts of India, Pakistan, Sri Lanka, Madagascar, South Africa, the South Pacific, and Eastern Europe. Gotu kola grows best in moisturized marshlands, such as on riverbanks. Tropical climate conditions are also required, as this is its natural habitat. However, commercial gotu kola tends to be harvested from the wild rather than grown in nurseries or in specific fields. Gotu kola is a perennial, herbaceous creeper that has small fan-shaped green leaves, with white or light purple-to-pink or white flowers, and it bears small oval fruit. 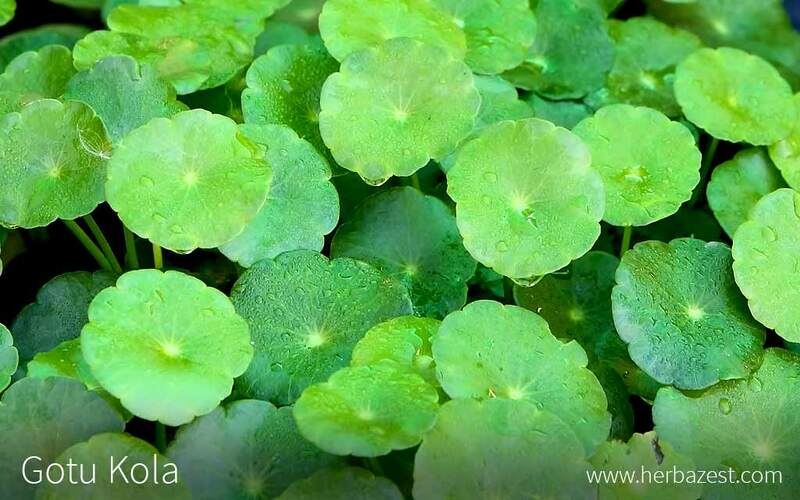 Gotu kola (Centella asiatica) is a member of the Apiaceae family, which comprises around 434 genera and 3,700 species of flowering plants, including carrot (Daucus carota), celery (Apium graveolens), and parsley (Petroselinum crispum). The Centella genus consist of only three species that can be found growing wild in many areas of the world, slightly varying in appearance depending on their surrounding conditions. Despite this, it is typical for their roots to give rise to reddish stolons. C. asiatica does not have any botanical varieties or subspecies. Gotu kola first appeared in medicinal lore as part of the Indian Ayurvedic medicinal system, around 1,100 - 500 years BCE. Over the centuries, gotu kola has been used as a leafy green vegetable in Bangladesh, Thailand, and Sri Lanka. It wasn't until the late 19th century, however, that it became recognized as a valid, botanical medicine. Gotu kola was carried by tiger hunters in India as a way of healing potential wounds resulting from encounters with these animals. It has been referred to as the "fountain of life" because it is said that a Chinese herbalist who took gotu kola lived for two centuries. Gotu kola is one of the most cultivated herbs in Southeast Asia, with India being its biggest producer. It is grown for both herbal medicine and culinary purposes. Gotu kola tends to have low yields, usually producing just 1,000 pounds (450 kg) per acre. In addition to being used in food and medicine, gotu kola can also be used as a mosquito repellent. The oil of the plant has also been known to be used in the production of soaps and shampoos.